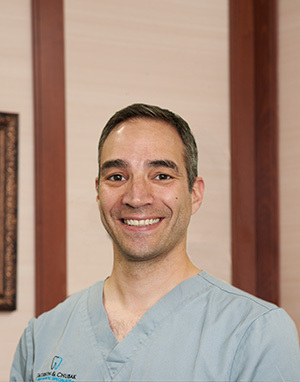 Dr. David Jacobson is an Endodontist, or Root Canal Specialist. He was born and raised in Bergen County New Jersey and attended Syracuse University where he graduated with a BS in Information Technology and Management. After building an IT Consulting and Software Development Company he returned to New York University College of Dentistry where he graduated with a DDS degree. During his time at NYUCD, Dr. Jacobson participated in many extra-curricular activities, was a founding member of the Peer Review Board, and was selected to the prestigious Honors in Endodontics program offered to a small group of highly motivated students with a high level of academic achievement who are particularly interested in endodontics. Dr. Jacobson was also recognized by the AAE by being chosen for the annual Student Achievement Award. After graduating NYU with his DDS degree, Dr. Jacobson was able to go directly into the Advanced Education in Endodontics Program at NYU. During his time in this two year program he trained under internationally known faculty including Dr. Paul Rosenberg and Dr. Asgeir Sigurdsson. As a resident Dr. Jacobson participated in two research projects and was selected at the 2014 – AAE Annual Session 2nd Place Table Clinic. Dr. Jacobson is married and has one lovely daughter. In his free time he enjoys spending time with his family, exercising, and going to the movies!